Mine can’t be the only home in America with an awkward spot that is a challenge to make appealing. We all have them, right? A nook in a corner, a shelf that is a little out of position, a open spot in a hallway, an angled corner that doesn’t make sense. Their location, size, position, or angle makes them a challenge to incorporate them, or make them look like a unified part of the whole. For me, these awkward spots are these two countertops that sit in front of a window. 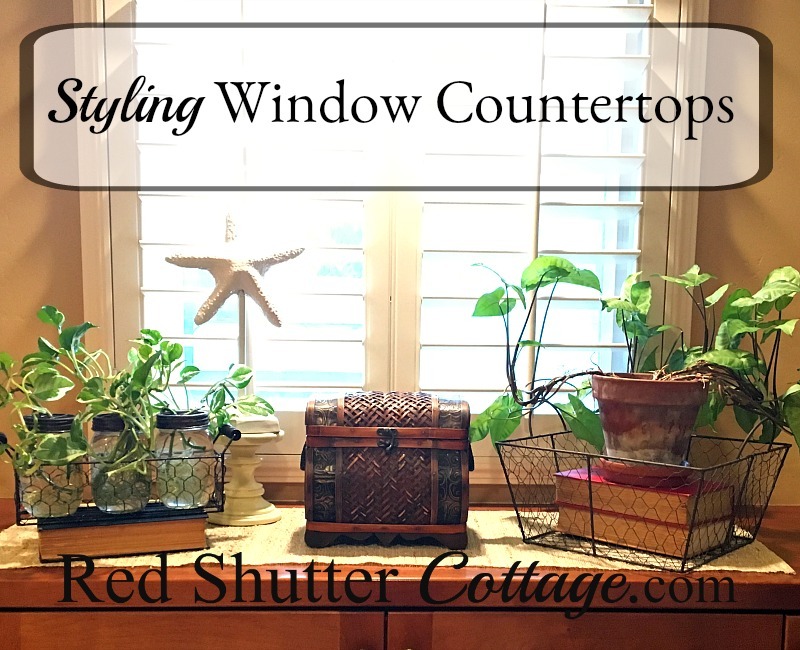 Which is how this post about how to style window countertops came about. 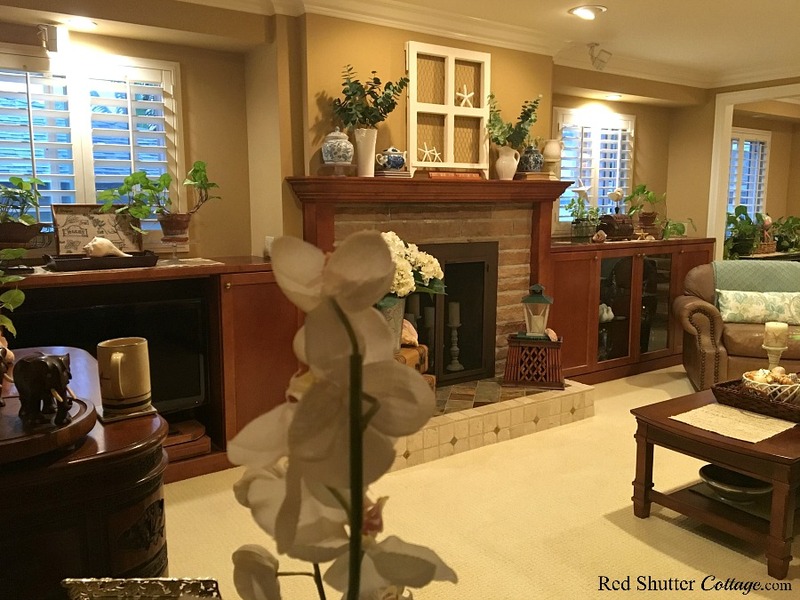 When we did the remodel, we added 2 built-ins, flanking our fireplace/mantel. The built-ins are 4 feet high, and on top of each built-in is a nice, 7 foot-long, 14” deep countertop. And above each of these counters is a window. Did I mention the window view is of the next door house? And it’s only about 6 feet away? And the view is of the roof? From the time we our remodel was finished, I have been stymied about how to approach these. The late afternoon sun comes streaming in from these windows, and all day long they do get light. 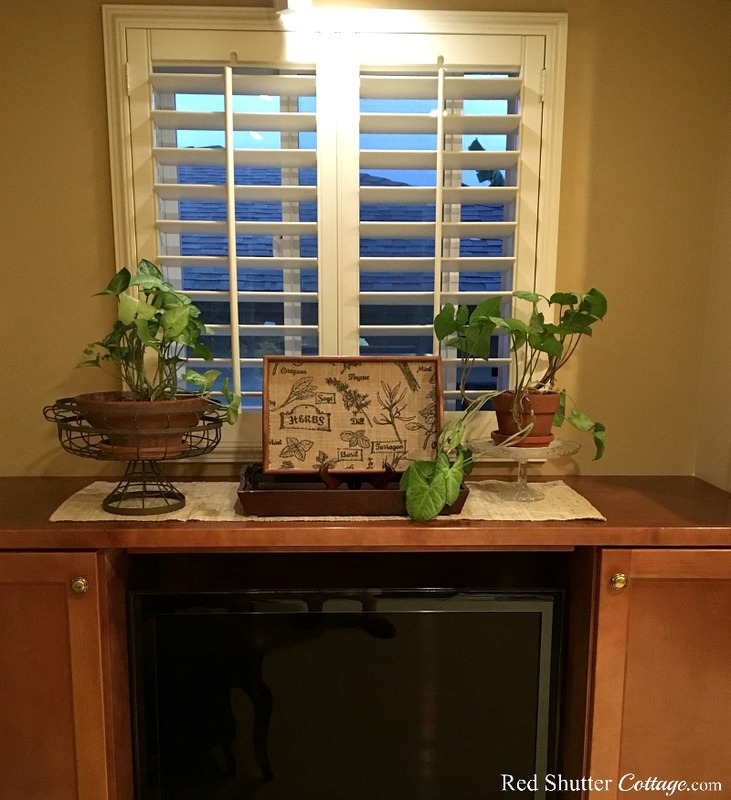 In the first years after our remodel, I had a compulsion to bring in plants, lots of plants, simply because this area is the only part of our home that gets light all day. So for the first few years, I put big pots of pothos and arrowhead plants on these countertops. But when I started blogging, I felt compelled to build a vignette on each of these counter tops. These would be in addition to vignettes I was already creating on the mantel, the coffee table, and the dining table. I began to realize was that in doing so, I was creating a lot of chatter. There was so much going on – everywhere – that nothing was standing out. 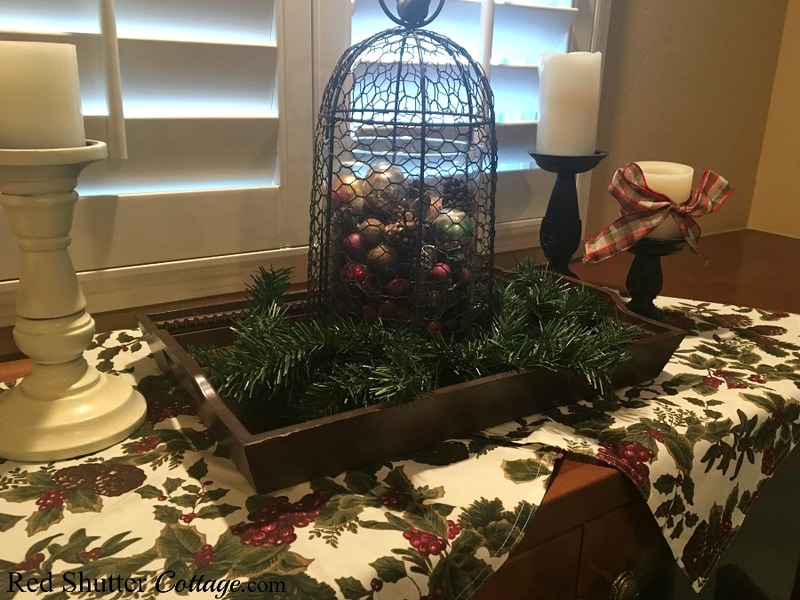 When I am decorating for any time of the year, my main focus areas are the coffee table, the fireplace/mantel, and the dining room table. 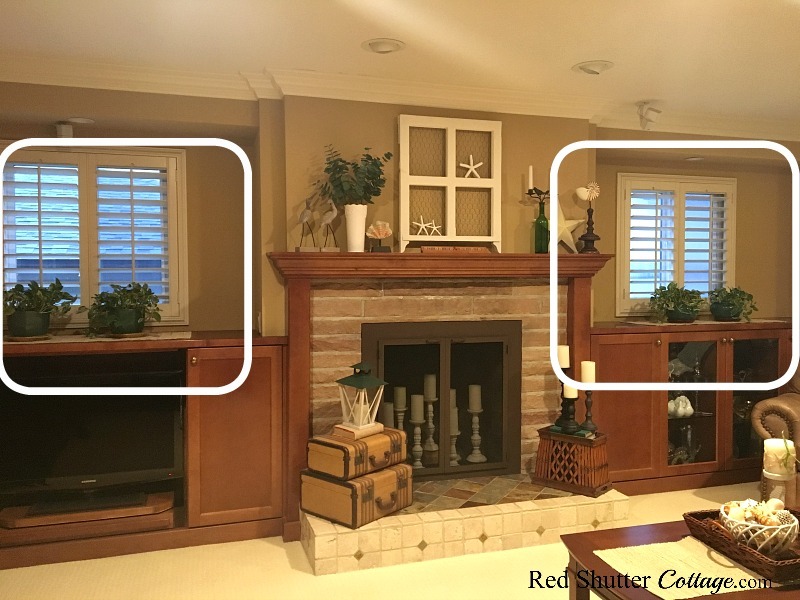 That is 3 main areas of focus; adding 2 more didn’t enhance the overall look of the room; it just made the room more busy. And it made it harder for the eye to find the focus of the room, which is our fireplace. Not just that, either. It was exhausting, because by the time I got around to these window countertops, I was frankly out of ideas and creativity. The end result was vignettes that lacked inspiration or life. And, unfortunately, I have the pictures to prove it. So I decided to make these two areas more ‘background’ than ‘foreground’. I realized that filling these two spaces with a perennial, neutral display was a smarter (not to mention easier) approach. 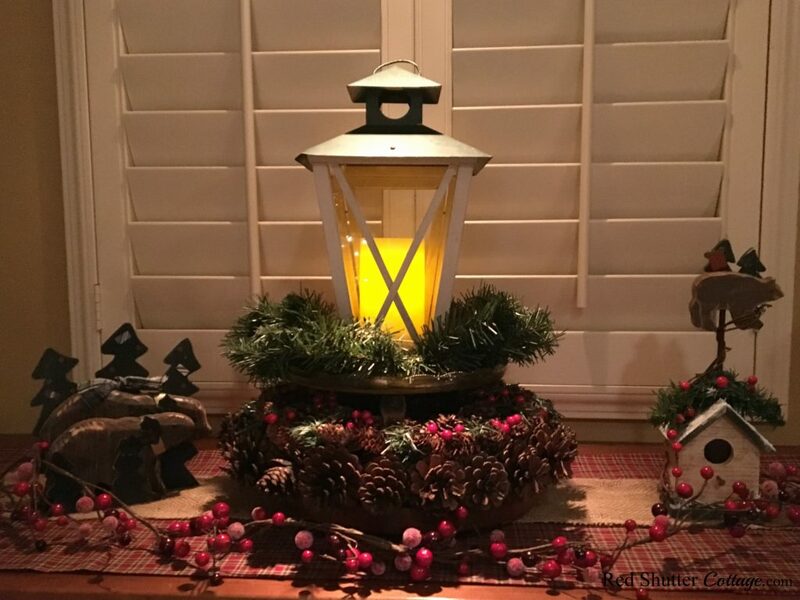 I also wanted something that would work on its own year round, but that also had the flexibility to at least contribute to, or be part of, whatever seasonal decorating was going on in our living room. And while I was at it, I might as well take advantage of all that light coming in through those windows. All this sounds like a very complicated approach, and a very specific demand. But the solution was very simple. 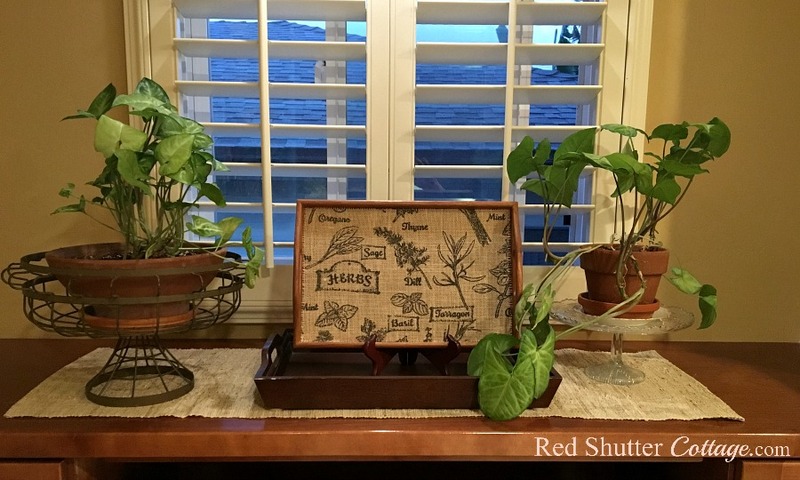 I realized that going BACK to plants on the window counters was the best approach. But not just two big green pots sitting in perfect symmetry. That’s a little too boring, a little too ‘background’. 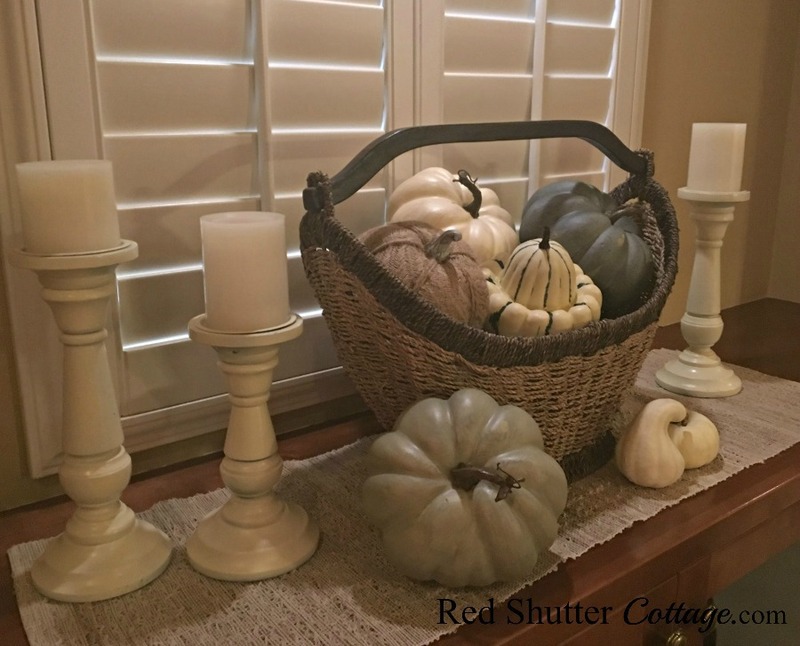 I love plain old terra cotta pots, especially when they age and all those shades and variations of color start to come out. So I started with two pots on the window counter on the right hand side of the mantel, along with one of my use-all-year-round straw runners. To make it a little more interesting, I put one pot inside this large chicken wire basket (from Lang.com) and stacked it on a couple of books. For a second set of greenery, I added this set of mason jars in a carrier (from Michael’s). I filled the Mason jars with water and added some pothos stems. 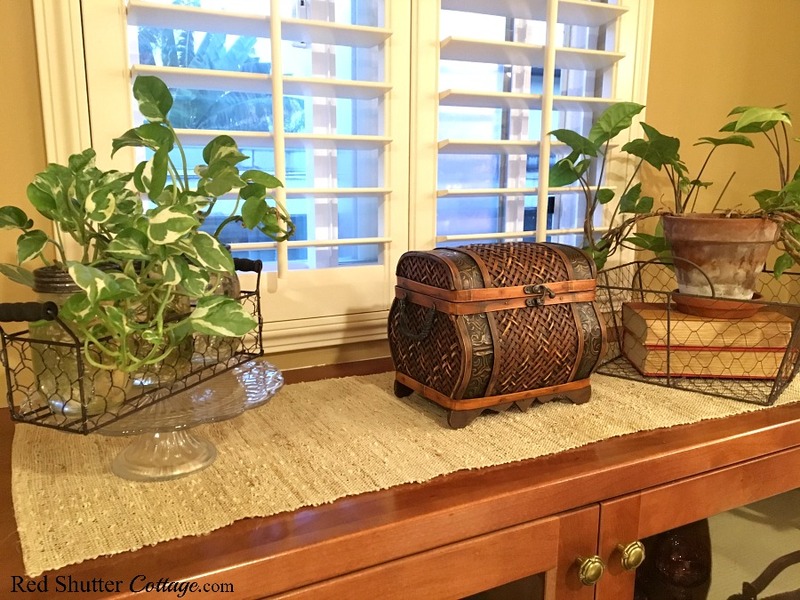 In the center I plopped down this wicker chest (thrift shop treasure). It reminds me of the chests they used to sell at the Bombay Company stores. 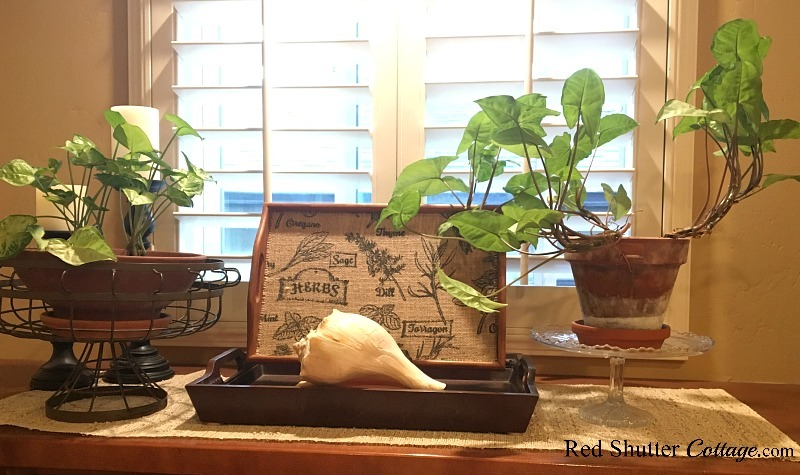 I use arrowhead plants for these window counters because as they grow, they develop high, windy, curvy branches. The ‘not so pretty’ view out of the windows recedes into the background. 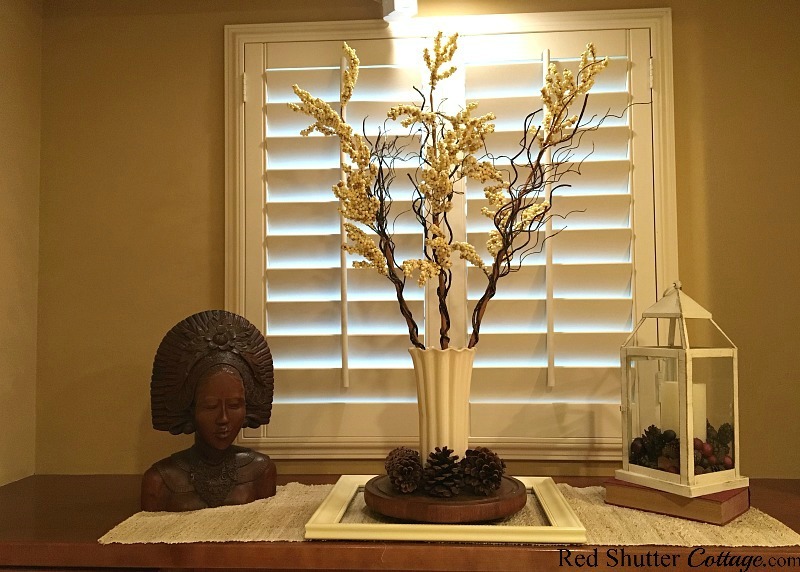 These curvy branches serve as a visual anchor that captures the eye and holds the attention. 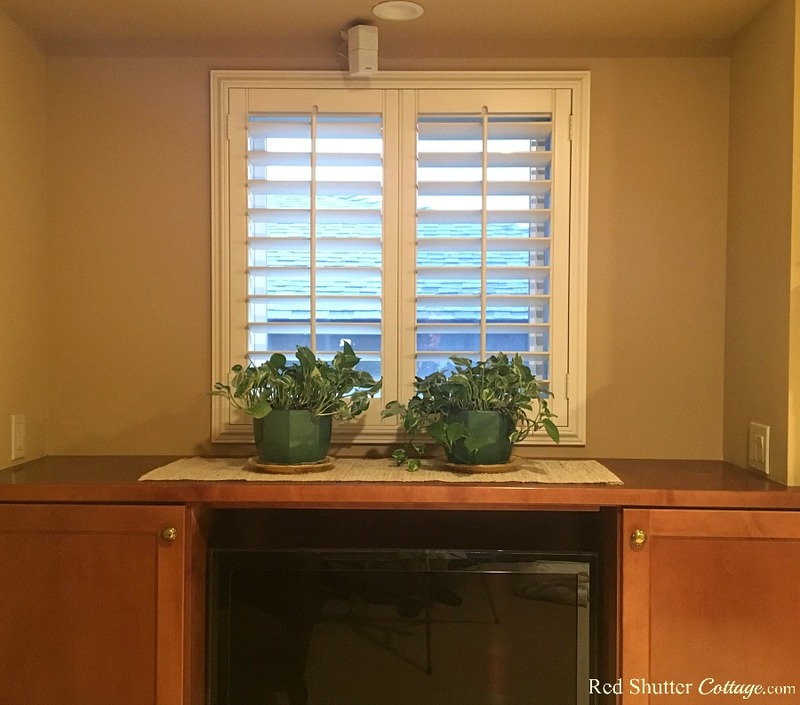 So far, I have just started to incorporate these new set-ups for the window countertops by including them in my Summer Living Room. I simply added some shells in with the plant arrangements, and was very pleased with how it all came together. Next up is fall, and we will see how the plants look with some pumpkins and gourds mixed in. My lesson that I learned here is to not fight an area, but to work with it. Because the countertops receive so much sunlight, I realized my original idea of plants was the best idea. By keeping the whole look of the countertops neutral of both colors and season, these two awkward spaces look just right year-round. If I want, I can add in a few seasonal accessories, so that they fit in with the rest of the living room, or just leave them as they are. They are background, and that helps keep the focus in the living room where I want it. 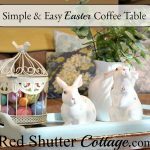 On the mantel, coffee table and dining table. Best of all, no busy chatter going on! What a lovely way to style a difficult area. 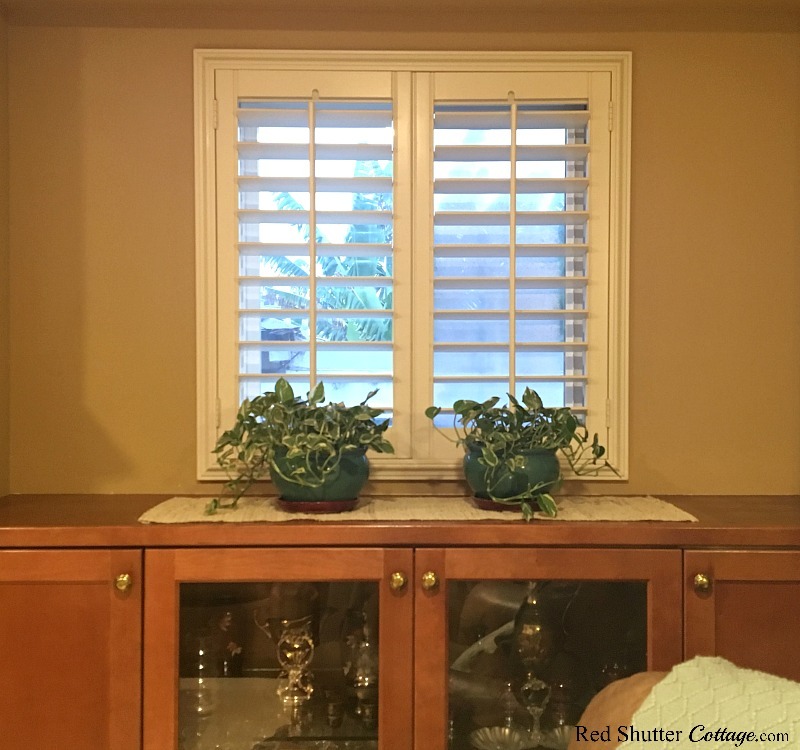 Your window areas look great! Thanks for sharing with us at Snickerdoodle Party. I’ll be featuring this at today’s party. Hope to see you there! 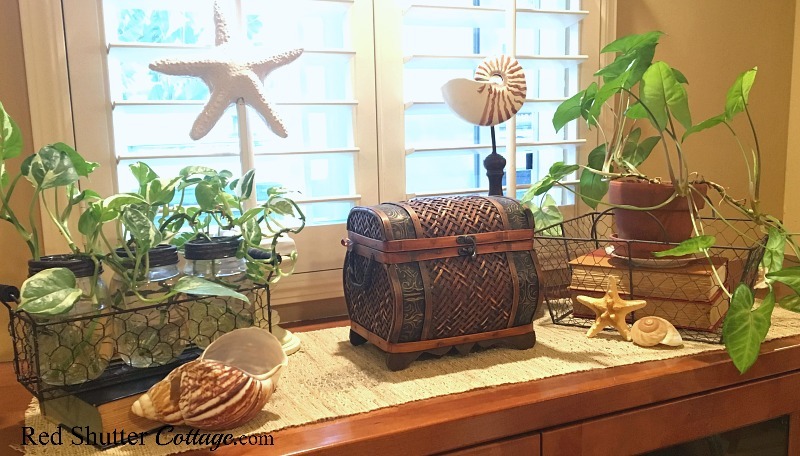 Beverly – thank you for your kind comments, and thank you for the feature! Wow-! I’m still a little new at this blogging game, so I am both flattered and giddy! My first thought was PLANTS when I saw the area you were struggling with! 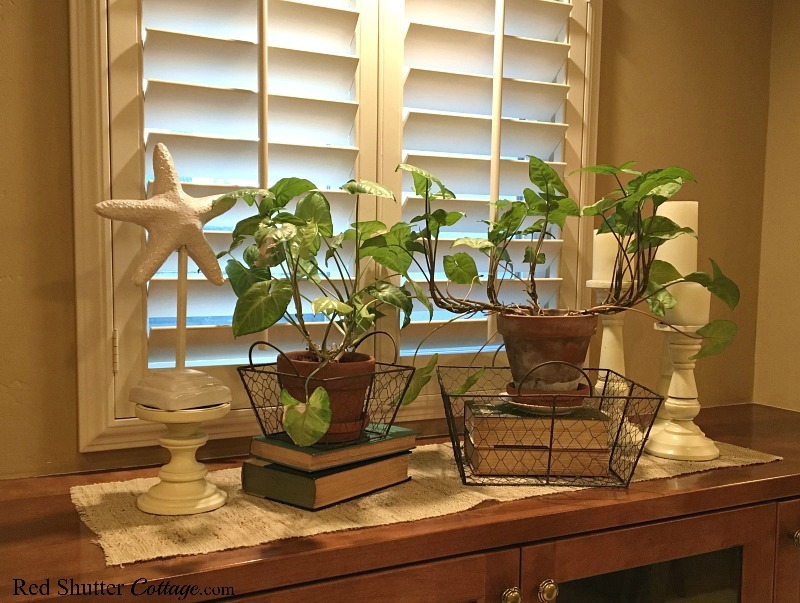 Of course I adore plants, and they are part of my decor year round. Now I know what the plant in my bedroom that’s not happy at the moment is called – arrowhead – thanks!! It was gorgeous for years, and now all of a sudden it’s struggling, and I’m not sure why. Debbie – you didn’t specifically mention how your plant is struggling…but, I had a time where my arrowheads were being choked by aphids and I could not find anything that worked. I almost lost them, but I went to the nursery and found this product that saved them. It’s made by Bayer Advanced and it’s call (2 in 1) Insect Control plus Fertilizer. It’s a packet with 10 tablets in it, and you just push them into the soil. I bought it at garden nursery; but maybe Target or Amazon might carry it! And I agree with you on the having plants year round. I have actually done a little re-arranging and brought back in the original group of plants. They really brighten up the room.